It’s a fact that many patients today rely on the reminders they receive from their medical providers. Moreover, this method shows the patient that you’re doing everything you can to ensure they get the best medical care possible. Money is a very common barrier standing between patients and adequate medical care. It’s not unusual for patients to skip medical appointments because they feel embarrassed or ashamed about their financial situation. So, when they see that your focus is strictly on providing adequate medical care (and you leave financial issues to be discussed by the appropriate parties), they’re more likely to keep their recommended appointments. Transportation is another very common obstacle standing between your patients and the care they require. When you hire a third party service, like MedBridge Transport, you’re taking one more step to remove those barriers and show your patients that their medical circumstances truly matter to you and your team. It's Tuesday morning and you are expecting 36 patients. To accommodate them you schedule staff, prepped your facilities and reviewed files only to realize that only 20 patients showed up! Not only did you lose revenue, but you incurred additional costs and lost time. Frustrated? 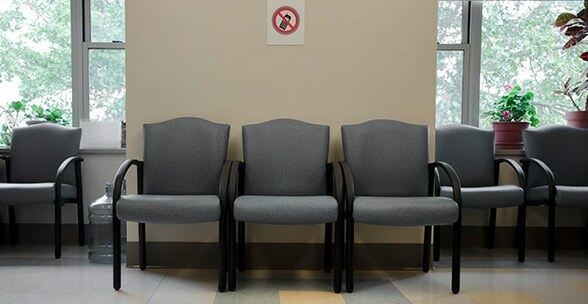 Well you are not alone, this happens to medical facilities throughout the country as medical practices experience on average 40% patient no-shows. How to solve it? Based on studies, up to 67% of no-shows are due to lack of transportation. Either the patient does not have family or friends available to drive them to a medical appointment requiring a designated driver or the patient is wheelchair bound and can't find wheelchair accessible transportation. To solve this, many medical practices are partnering with non-emergency medical transportation (NEMT) companies like Medbridge Transport to help alleviate this barrier to care. One Surgery center had equipment isssues at one of its locations, because of this they would have to reschedule all their patients, potentially losing them in the process. Instead, they reach out the Medbridge Transport requesting help transporting the patients from one location to the other and back to have the procedures done. This resulted in the patients getting the care they needed in a timely manner and the medical facility accomplishing a 15X return on the transportation investment. As you look for ways to solve your no-show problem, considering partnering with a NEMT company as that could reduce no-show by up to 68% in some cases.